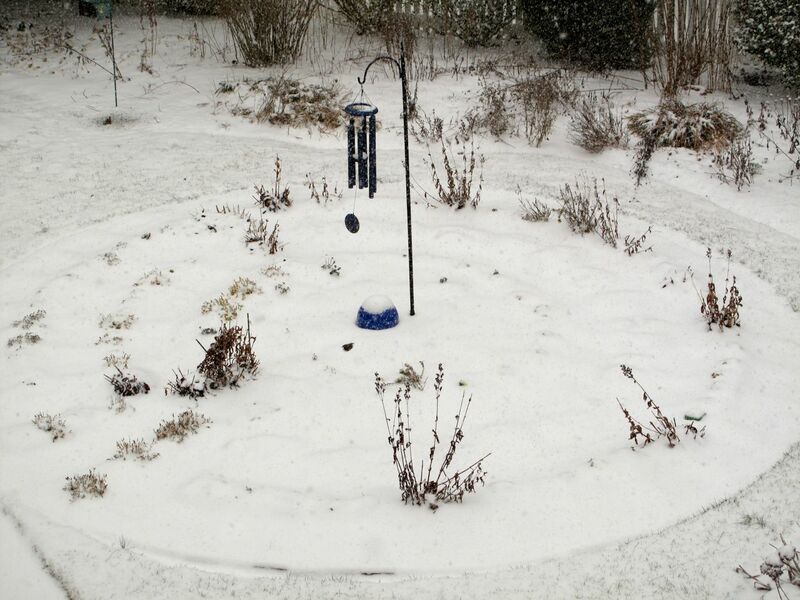 The snow storm is right on schedule and these sparrows and juncos are feeding frantically just below my window. 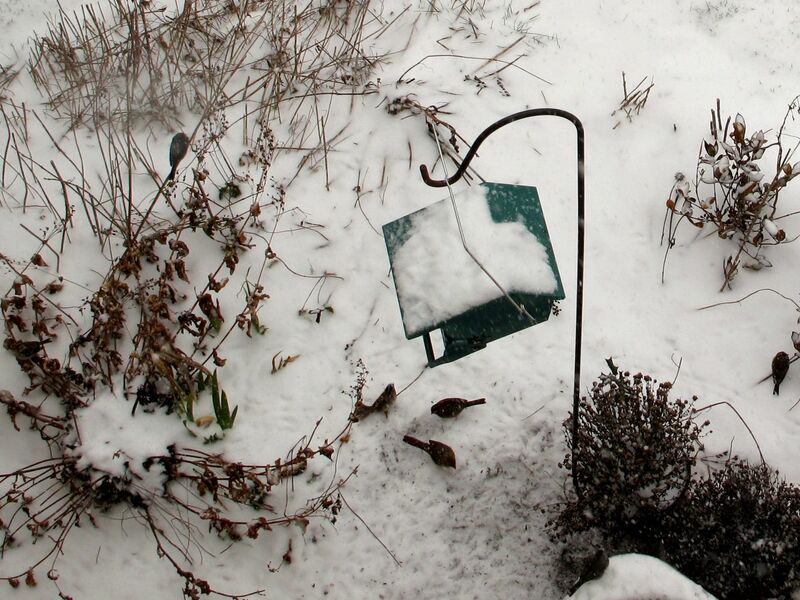 Cardinals and towhees are dominating the other feeder but they all keep trying. A bluebird eyes the situation from the chimes in the meditation circle. Snow is a big event here. 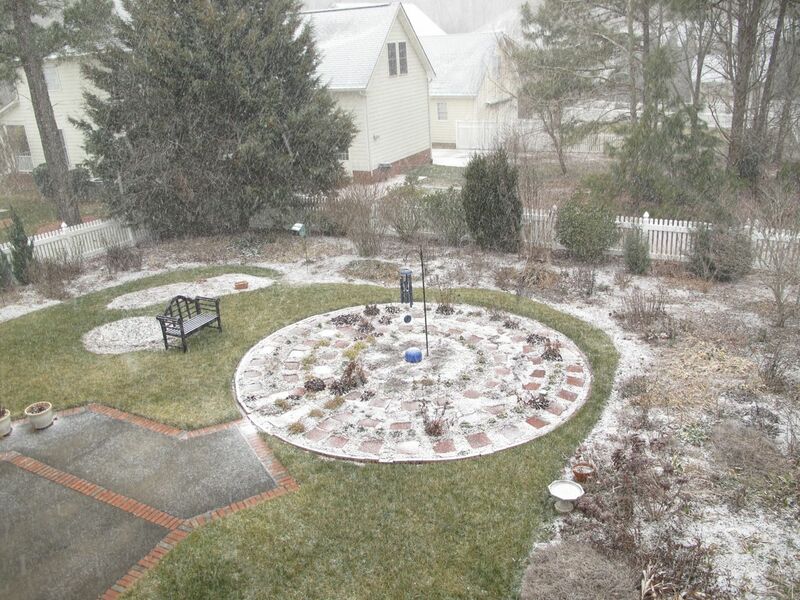 It started falling about 12:45pm and quickly began covering the mulched areas of the garden. 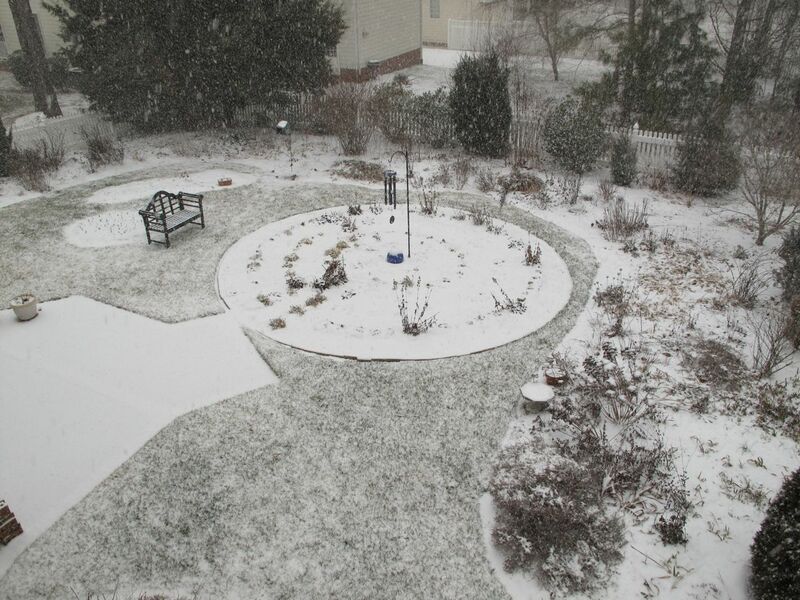 A half-hour later the grass is mostly covered. The meditation circle filled in quickly. See the little bird near the center? 2:35 pm. Still snowing. 23°F/-5°C. After two hours of snow the labyrinth is disappearing. Neighbors have reported the roads are quickly becoming impassable, but with our errands done we will just enjoy the beauty of the snowfall and cross our fingers the power remains on. 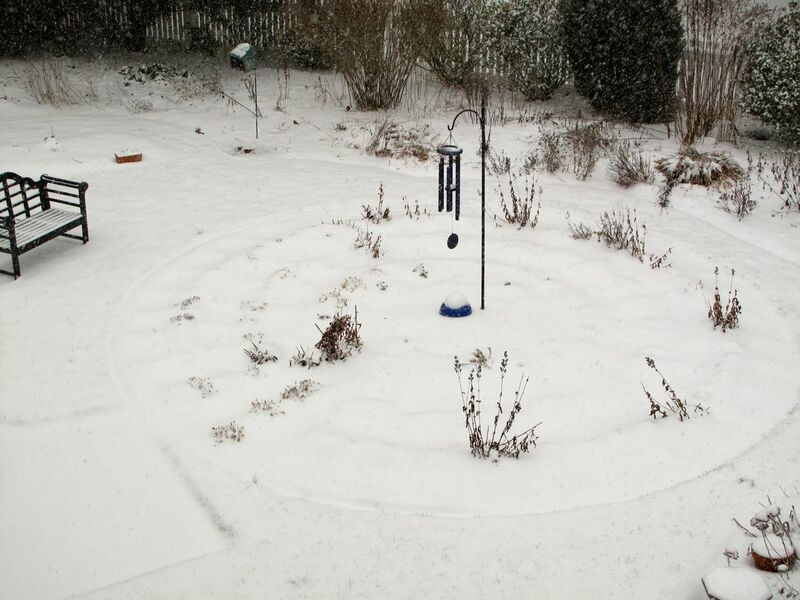 This entry was posted in garden and tagged labyrinth, meditation circle, snow, winter garden on February 12, 2014 by pbmgarden. Great to see the snow gradually getting deeper! Stay warm and snug indoors! It’s been fun to watch the snow today. The blue ball in the middle of the meditation circle has disappeared completely now. It was beautiful, but treacherous now. Six inches so far here, your 13 sounds like way too much. Enjoy and be safe. Take care and stay warm and safe. It does look pretty but it can be so dangerous. Thanks Pauline. Everything got an icy coating overnight which makes it tricky. We’re supposed to get more snow today so I’m just enjoying it from indoors. Nice countdown! Since you can stay home, enjoy! I hear it was crazy in your area yesterday afternoon. Snow started here around 7 a.m. so we were hunkered down all day. 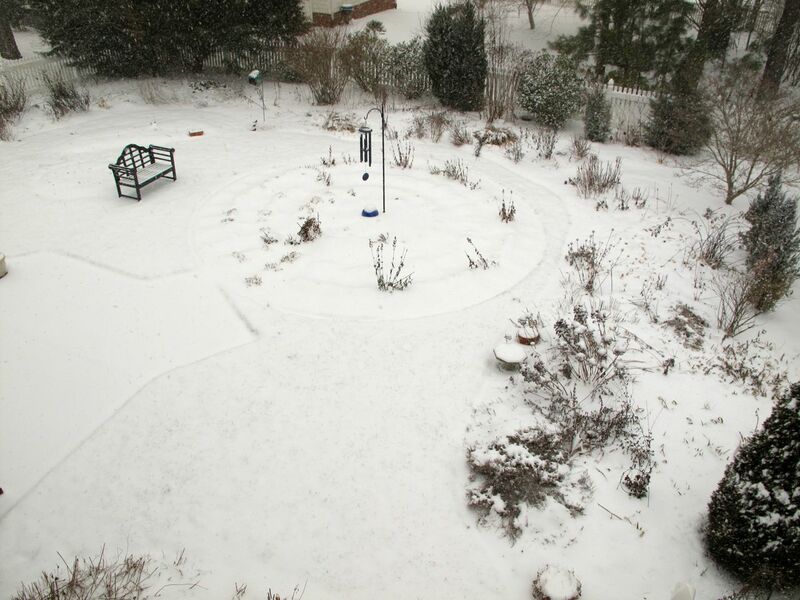 In the end, we had 2-3 inches of snow and before it turned to sleet so not nearly as much accumulation as forecast. Thankfully, no loss of electricity. We are having a lovely snowfall this morning from the “wrap around” but all should be finished soon and the afternoon temps will begin the thaw. Stay safe! Glad you’ve kept power. That helps so much. We didn’t venture out after the snow started but heard lots of people had multiple hour commutes for what should be a quick 15-minute drive. Even the UNC-Duke basketball game was cancelled when Duke’s bus couldn’t make it to pick up the Duke team! Thanks Annette. Yes, snow is so rare here it is a big deal when we get to see some. It’s a treat. Your snow looks like the nice civilised sort, even though it caused delays. We haven’t had any snow here in the east of England this winter, lots of rain and for large parts of the country horrendous floods. Keep warm! I’ve been reading about the terrible rain/floods in England. Hope you’re not suffering from it. Do you usually have snow in your area? The weather seems all turned around this year. Hello, snow does not come every winter here – our councils are never prepared and we grind to a standstill when it does snow, this year we just have some flooding in the nearby fields, but we are very lucky compared to some in the UK, whose homes are ruined. Glad it has not lasted and was only a couple of inches….